Just steps away from the bottom of the Giant Ocean Tank, filled with its vibrant species from the Caribbean, you'll find the Armed and Venomous exhibit. This exhibit is filled with interesting fish including the rockfish, pufferfish, and the lionfish—with its dramatic fins and destructive spines. 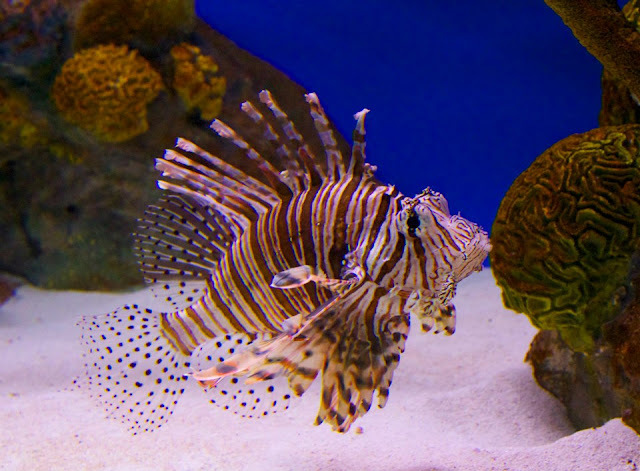 These days, lionfish can also be found in Caribbean reefs, but that's not a good thing. This invasive species has no natural predators in these reefs, and divers are finding them in increasing numbers. And yet... Even though they are an unwelcome sight on Caribbean reefs, they are quite beautiful. Their graceful fins and and bold stripes are captivating, and that's all the more evident in this stunning slow-motion video. Take a look. This video was also used in our first television ad campaign in decades! Watch the videos and check out last summer's full ad campaign.